Simply add [fun-facts] to your posts or your pages. Can I add my own fun facts? There is an easy interface built in the plugin to add your own fun facts. Go to Settings > Fun Facts to do that. Add one fun fact per line without HTML code. HTML encoded characters are OK.
No. Because of the new widget implementation, you need to use WordPress 2.8 or later. 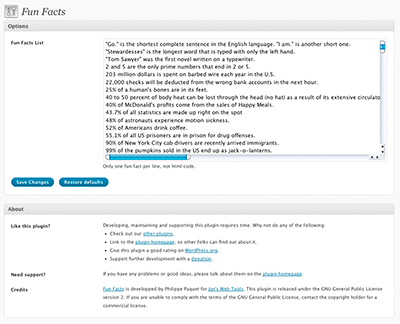 If you are using an earlier version of WordPress, you can try using Fun Facts version 1.0 but, really, you should upgrade. Add code to allow the widget to be inserted anywhere in a template or a page. but it just doesn’t want to display anything. It look like the database query doesn’t return anything. I will contact you by email to help you resolve the problem. I am having the same problem. I added funfacts but it doesn’t display anything. I can’t access your website. I will follow up with you by email. It look like another database problem. I will contact you by email to help you resolve the problem. but on my page, it doesn’t work. The Widget appears, but no Facts … ? Plugin stopped working in WordPress Version 2.8.3. It just doesn’t display any facts. Just disappeared. Looks like I am in the same situation as above. Can you help? You shouldn’t have anything to configure. I will contact you by email to help you resolve the problem. That may be due to the way you updated WordPress. I will contact you by email to help you resolve the problem. I will contact you by email to help you resolve the problem. Is there any way to display the fun facts without having to put it in the sidebar or use [fun-facts]? Not at the moment but I could add that to the plugin. What did you had in mind? Maybe something along the lines of manually inserting a function into the source code that calls the plugin. Wherever the function is placed in the source code would determine where the plugin displays. That’s a good idea. I’ll add that in a future version. We tried your plugin, but each time we put a fun fact in and click save, the form blanks out and deletes all of our fun facts. We are running the lates version of wordpress with the Bluelight theme. add widget but doesnt display anything on the webiste. Hi — I’ve installed the plugin but each time I enter a list of fun facts, and click “save changes” the fun facts all disappear. So I can’t get the fun facts to actually appear anywhere. This little widget is just what I was looking for. I have no idea on how to make this work on my website. Can you email me the code and I can cut and paste it in the website admin. space? Please please add a manual code that I can just paste into the sidebar. I love the plugin but am running into HELL trying to configure my .css and the plugin to display the title and format the text appropriately. I can’t download this plugin. Thank you very much for pointing that out. It’s fixed now. Love your fun facts plugin, one question though, do you have options of having the link back to your site removed in case external links aren’t allowed? Is there a way in which you can refresh the fun facts widget without refreshing the entire page? This would be a nice feature to have a link “another fact” or something along those lines. Just a thought. is it possible to display all facts on a page? First off – love the plug-in. Best one out there for random facts. Thanks. A couple of questions. How can I eliminate there being a blank space in the random sequencing of the facts? Every so often, when hitting refresh, there is a blank space with no fact. I have deleted all spaces before the first fact and after the last. Second, is there a way to get the facts to go in order instead of randomly? There are a few facts that come up a lot more than others. Nice plugin. There’s a bug, however. Your randomization code finds an ID between 0 and number_of_facts-1. That means that when I have 3 facts, 1/3 of the time it shows no fact (because there is no record with id 0), and my third fact never shows (because the range is 0-2, instead of 1-3). no Fun Facts seen there. When I want to add a Fun Fact it disappears when saving. What’s wrong? Hi, I just customized a few fun facts and now they’re not returning anything at all. Is this a user issue, or have you heard of anyone else having this problem? I replaced the default set with 3 custom lines, all were saved, but the widget shows up blank on the site now. Love the plugin and use it on 2 sites (the one above and http://DirtyLittleBlog.com). I have the weird question of the day for you: on the fishing site, I have replaced the Fun Facts with Fishing Quotes and it stays that way for a while but then Fun Facts get added without me knowingly updating the plugin. Is there anyway to stop that from happening so I can just keep the quotes?